After careful consideration of the PHS senior applications submitted, the scholarship committee and the PHS Guidance Counselor selected the recipient and awarded the scholarship based upon character, leadership abilities, academic standing, financial need and an essay by the student telling why they wanted to go to college and why the scholarship was important to them. 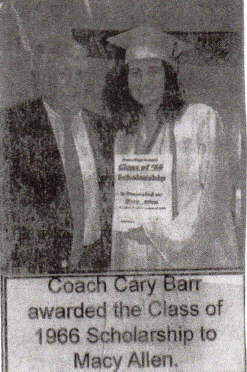 On May 27, 2009, at the PHS Awards Day Ceremony, Steve Lewis represented our class in presenting the first Class of 1966 Memorial Scholarship. 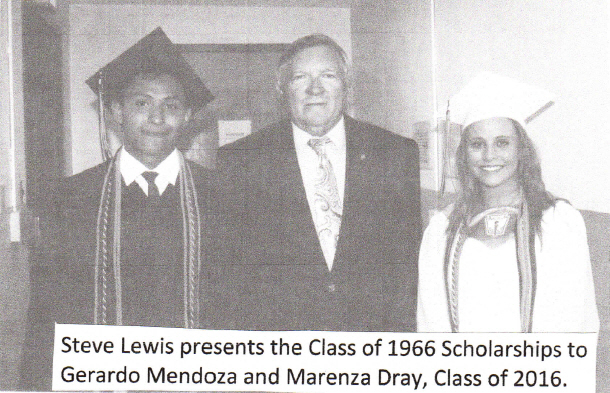 Since that day, with your kind donations, our class has continued each year, after careful consideration from the Scholarship Committee and the PHS Guidance Counselor, to award a recipient this scholarship. We need your support as our class continues to make a difference in a young person’s life. Please consider this a challenge to contribute any amount you can at this time to the scholarship fund to allow it to grow and continue making a difference in a young person’s life. Several of our classmates have already stepped forward and met this challenge. Please make your check payable to: Paris High School Class of ’66 and mail it to Judy Shannon Pry, 815 Ruddles Mill Road, Paris, KY 40361. Remember, a little from each of us will mean a lot to a deserving recipient. It is wonderful knowing that we all had a part in making a difference in a young person’s life. To continue to make a difference a challenge is sent out to each of you to contribute in any amount you can at anytime you can to see that the Class of 1966 Memorial Scholarship continues for years to come. Several of our classmates have already met this challenge and have sent checks. Find below pictures of past students presented awards. A big thanks to you all for supporting this important project of our class. 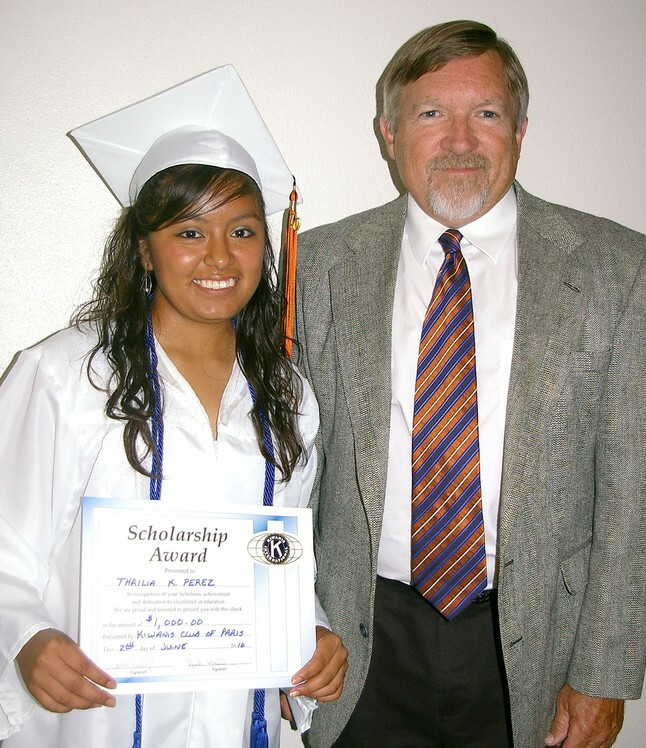 Steve Lewis stands with Thailia K. Perez, the 2010 Class of 1966 Memorial Scholarship winner. 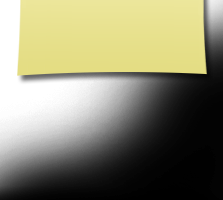 Thailia is currently enrolled at the University of Kentucky. 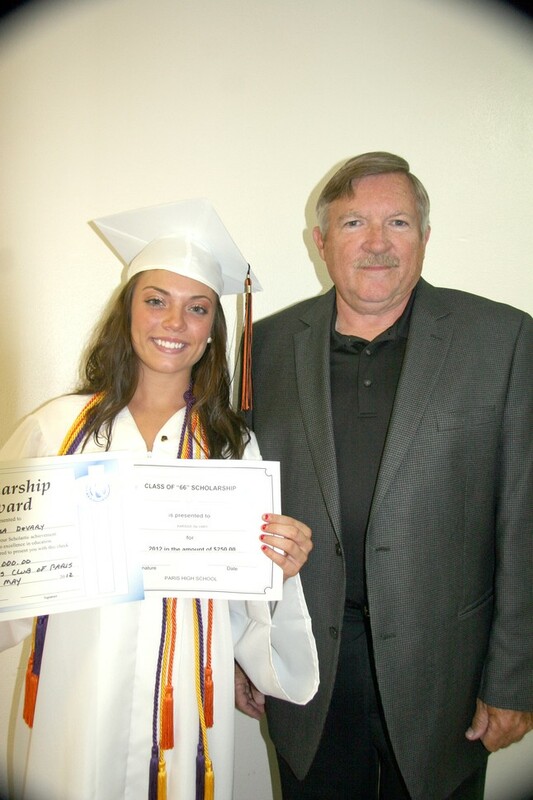 Casey Crutcher, the 2011 recipient, receieved the Class of 1966 Memorial Scholarship. 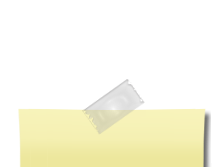 However, no picture has been recieved or found thus far. If you know of a picture, please send it to me at "Contact Us". 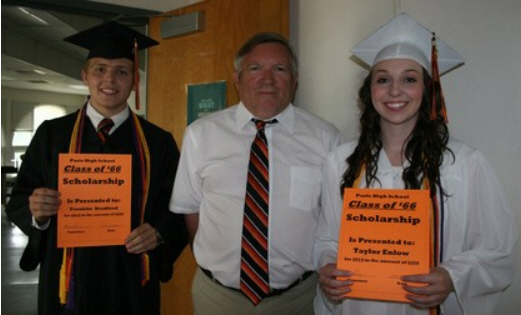 Steve Lewis is shown here presenting Karissa DeVary the 2012 Class of '66 Memorial Scholarship. 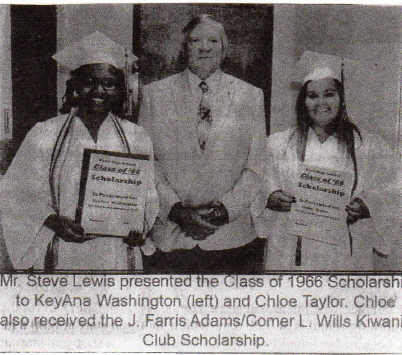 Steve Lewis presents the 2014 Class of 1966 Scholoarship to Frankie Bradford and Taylor Enlow.